TV3 is committed to offering its viewers socially relevant and quality programming with its well-earned reputation of maintaining high moral and ethical standards while supporting and promoting the Catalan culture and language, encouraging innovation and creativity, and making full use of multiple resources and all available platforms. TV3 (Televisió de Catalunya) is part of Corporació Catalana de Mitjans Audiovisuals, the leading communications group in Catalonia. It operates under the aegis of the Catalan Parliament and is financed both through public funding and advertising revenue. (*) Catalonia is located in the northeast corner of Spain with a land area of 32,107 km2, and a population of seven million people. For nine years running, TV3 has been the most widely-viewed channel by Catalan audiences. In the last year it obtained the largest audience share in 6 years and is the generalist TV channel within its territory, boasting the largest growth and the strongest standing in the most-watched daytime and prime time slots. It leads the audiovisual market within its territory, outranking other generalist TV channels which broadcast throughout all of Spain. These results reflect TV3’s attention to the tastes, interests and needs of its audience. Viewers consider TV3 to be the channel to which they can most relate and also the one producing more high-quality programming (*1), including its fiction programs which have always drawn wide audiences and consistently offer value entertainment, thanks to its constantly fresh approach to subjects. TV3’s documentaries have, from the start, stood out for their depth, choice of subject matter, and careful research and presentation. As a result, today TV3 stands apart in being able to program documentaries in prime time slots with leading audience results. The news programs, internationally recognized for their innovative format and presentation, enjoy wide viewer support and are considered Catalonia’s leading news source with audience numbers doubling that of its competitors. Children’s programming and the spin-off activities both on and off screen are an excellent example of the social impact of our child-oriented television content. TV3-Televisió de Catalunya, is the leading name in Catalonia’s audiovisual industry and also an important driving force in production in Spain as a whole. It finances approximately forty-seven projects a year that include documentaries, fiction and animation. These are television and film productions which are, for the most part, broadcast by the main channels and/or shown in leading cinemas in the country and have international outreach as well. TV3’s inventive and creative approach places it at the forefront in the audiovisual sector. TV3 - The first channel, with general content. It is addressed to the public at large and family audiences, with a broad range of programming and a strong news profile. TV3 is the channel of choice for the majority of Catalans. 33 - This channel offers diverse programming for specific audiences, focused on culture, knowledge and discovery. It is an open window to experimentation with new audiovisual languages and formats. 3/24 - A 24-hour news channel, respected not only for its thorough coverage and attention to local as well as international issues, but also for it’s constant innovation. Super3 - A channel targeted to, and a favorite of, children and youth audiences, with its associated ClubSuper3, boasting over a million-and-a-half members. Esport3- Televisió de Catalunya’s sports channel, offering 24-hour access to sports events as well as nature- and adventure-related programs. TV3cat- An international channel that broadcasts Televisió de Catalunya’s contents around the world, via Internet, cable, telephone line and mobile phones. TV3 has led the field of the most-watched channels in Catalonia, outranking televisions that broadcast throughout the Spanish territory. TV3 had a 14% audience share, 4.2 points ahead of its two closest competitors in second place, thus maintaining its leading position for the ninth year in a row. A record in Catalonia and in Spain. According to qualitative studies, TV3 once again continues to hold the record achieved over recent years as·the generalist channel most highly-valued by viewers with an average rating of 8.5 out of 10, according to the GFK program quality panel (*3). Every year the news programs receive the highest ratings. This year another record was broken with a score of 8.6 out of 10 for credibility and impartiality. 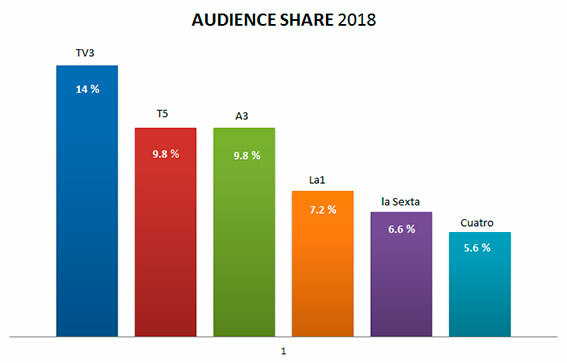 TV3- Televisió de Catalunya was also the leading Web channel in Catalonia in 2018, regarding user numbers and video viewings. 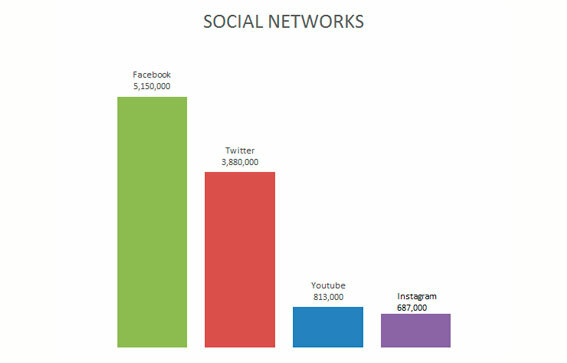 The digital audience of unique users grew by 11% compared to the previous year. Video views surpassed 110 million. The number of followers on the social networks continues reaching record figures and increasing numbers of users access the group mobile apps. Successful results that are repeated year after year and which place the Corporació Catalana de Mitjans Audiovisuals as a point of reference in the communication sphere within Catalonia(*4). TV3-Televisió de Catalunya keeps a constant focus on innovation and change. Part of the channel’s main strategy is to be present on all of the platforms for content distribution and to encourage a direct relationship with our viewers. As a result, TV3’s profile, and that of its programs, on the social networks remains prominent both within and outside of Catalonia. The mobile phone apps and applications for connected TVs—especially those focused on videos and news—are widely popular in Catalonia. With the aim of reaching the greatest number of viewers TV3 is also accessible on the Internet through the TV3alacarta service via different platforms: the Web, mobile phone and tablet applications, consoles, applications for connected TV and televisions with HBBTV. Over the years TV3 has steadily received recognition for its programs. In the fiction sphere, TV3 productions such as “Polseres Vermelles” (The Red Band Society), “Merlin” and “Nit i dia” (Night and Day) have met with great success in Italy, France, Germany, the United States and Latin America. In 2019,TV3 continues to stand behind good talent and launch new programs. In the fiction area, two productions will be featured this year: the first is season two of the successful series “Benvingut a la Família”, (Welcome to the Family), a very bold and cutting-edge black comedy. The second production is a new series targeted to a young audience, titled “Les del Hoquei” (Roller Girls) focused on sports, relationships, and inter-generational conflicts, and offering stellar moments on our programming grid. All imaginative concepts with new twists and quality guarantee.